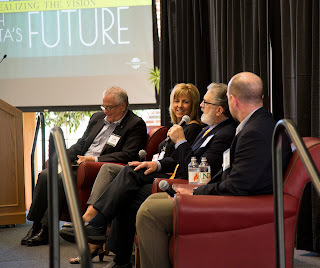 The Energy & Environmental Research Center (EERC) hosted the 2nd Annual Partnership Summit on June 8. The event served as a forum for partners from multiple energy industry sectors to discuss critical topics. Attendees advanced their partnerships and worked on a collaborative action plan for environmentally responsible use of energy, contributing to an “all of the above” approach to energy production. University of North Dakota (UND) men’s basketball coach Brian Jones kicked off the event with his message on appreciating winning through the experience of loss. 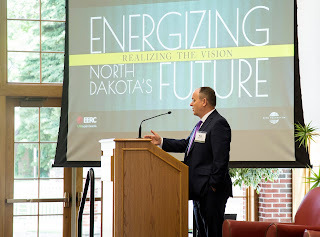 UND President Mark Kennedy and North Dakota Petroleum Council President Ron Ness welcomed the attendees, who represented public utilities, private industry, government entities, and energy research experts. Dr. Randall Gentry, Deputy Director of the U.S. Department of Energy’s National Energy Technology Laboratory (NETL), discussed the role of NETL in using domestic resources to power our nation’s homes, industries, businesses, and transportation economically, while protecting our environment and enhancing our energy independence. A multidisciplinary discussion panel focused on current challenges and highlighted the strength created through collaboration in North Dakota. Panelists included Nicole Kivisto, President and CEO of MDU Resources Group’s Utility Companies, Lynn Helms, Director of the North Dakota Industrial Commission, and Justin Kringstad, Director of the North Dakota Pipeline Authority. Charles McConnell, Executive Director of the Rice Energy and Environment Initiative, moderated the panel. Keynote speaker Dr. Mark Pearson, CEO of Liberty Resources, LLC, identified the challenge and vision of getting the next increments of oil and gas out of the ground, emphasizing how new technology must continue to improve recovery from the Bakken. Charles Gorecki, EERC Director of Subsurface Research and Development, and Brian Kalk, EERC Director of Energy Systems Development, outlined goals for North Dakota’s energy future. These goals include doubling or tripling the current oil production in the state, eliminating pipeline leaks, increasing oil recovery rates in existing wells, maximizing the use of North Dakota natural gas and energy export opportunities, and making the best use of synergies between the agriculture and energy industries. Specific ideas discussed were using nanotechnology in pipelines to detect potential leaks and the feasibility of using carbon dioxide captured from energy production in greenhouses to grow produce year-round in North Dakota. “From the opening comments to our luncheon keynote, the theme of change was prevalent—the change that has occurred and the change necessary for all of us to capitalize on the incredible opportunities ahead,” said Erickson.